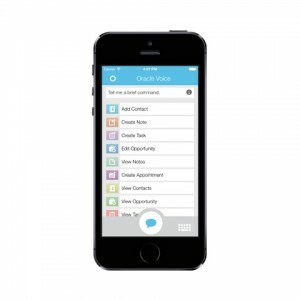 Oracle Voice is a fun, Siri-like Virtual Assistant for Sales Reps. 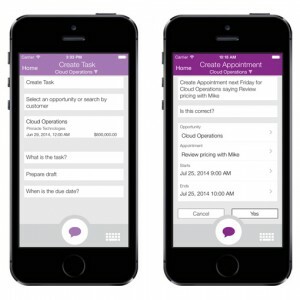 It makes it easy to interact with Oracle Sales Cloud on a smartphone simply by talking or by tapping and typing if needed. Having a fast, friendly and fun way to view and capture sales data boosts sales productivity and provides improved visibility across the company. 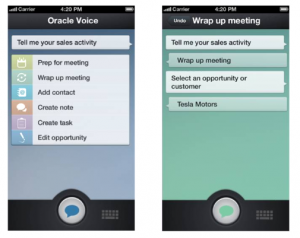 Oracle Voice acts as a virtual assistant for sales teams so they can interact with Oracle Sales Cloud as they would in a natural spoken conversation to update and view information about their opportunities, contacts, notes and activities. Designed for Sales Reps using smartphones, the conversational interface also allows for tap and type interactions when appropriate. This improves efficiency for common sales tasks such as preparing for a meeting or adding notes and updating records after a sales call.